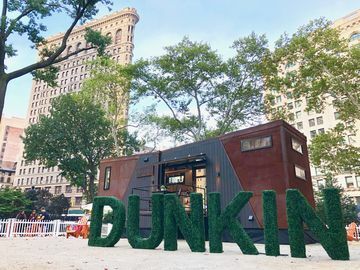 To honor and celebrate this “day of dozens,” Dunkin’ Donuts is putting a spotlight on unique donuts available in its restaurants across the globe. With locations in 32 countries, such as Korea, India, Russia, and Germany, local flavors and tastes provide an opportunity to create a variety of delicious donuts for our guests to enjoy. 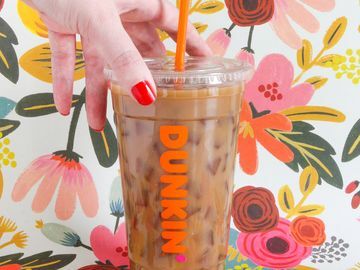 "Donuts are a brilliant canvas for innovation,” said Stan Frankenthaler, Executive Chef and Vice President of Global Product Innovation at Dunkin’ Brands. “There's something truly artistic about mixing and matching different combinations of donut shapes, fillings, frostings, and decorations to create excitement and appeal to unique audiences around the world." While this donut has truly gone global, it’s originally from the United States and continues to be one of our most popular donuts. Fun Fact: In 2007 the Boston Kreme was named the Official Donut of the Commonwealth of Massachusetts! The Chicha donut in Peru is topped with a purple corn juice icing – a local flavor that you’ll also find in Coolatta® beverages! 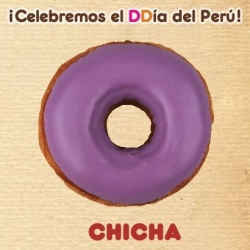 The donut was created as part of a “Patriot Dozen” donut series to celebrate Peru’s Independence Day. Other donuts in the series include designs and flavors inspired by local hobbies, food, and Peruvian history. 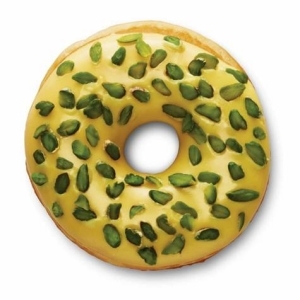 Another interesting example of how Dunkin’ Donuts customizes its donuts to appeal to local taste preferences can be found in the Middle East, where guests enjoy donuts with the flavors of rose, pistachio, dates, and more. 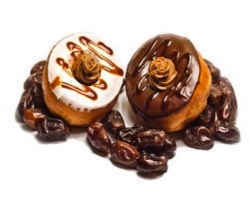 The above Dates Donut features either chocolate or white icing and is topped with a date syrup drizzle. 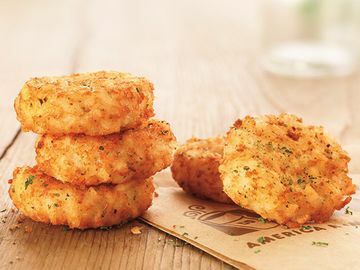 For those craving a more savory treat, Dunkin’ Donuts restaurants in China feature donuts with flavors such as pork, seaweed, and fish. 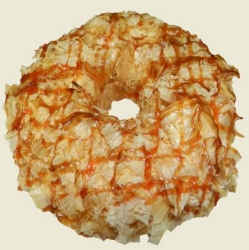 The Dried Bonito Donut, pictured here, is topped with dried bonito fish and a sweet teriyaki sauce glaze. 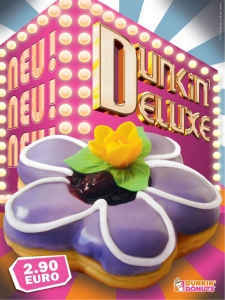 True to their name, Dunkin’ Deluxe Donuts are oversized glazed donuts shaped like a flower with decorative icing and a fruit-filled center. These donuts come in a number of berry flavor varieties. One bite of this sweet treat from Thailand will transport you into donut paradise! 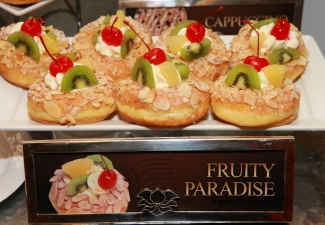 The Fruity Paradise Donut features a glazed donut with whipped cream, toasted almonds, pineapple, kiwi and cherry. 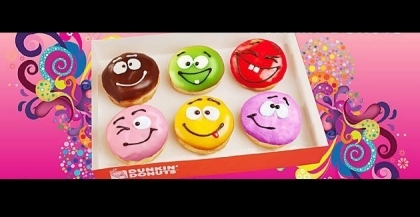 Instead of sending an emoticon in an email, or text, Dunkin’ Donuts guests in Russia can share their winks and smiles with one another in person with these colorful donuts. All feature playful names related to their facial expressions, like the Moscow Wink! A donut that DDoubles as a sandwich? 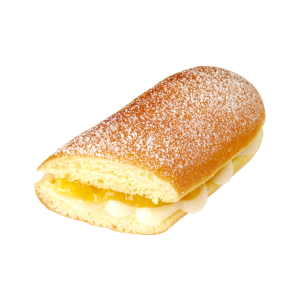 In Korea, this sandwich is a sweet treat featuring fresh pineapple and soft cream cheese on a thin, long stick donut. 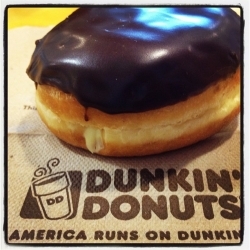 Have you ever travelled to a Dunkin’ Donuts internationally? 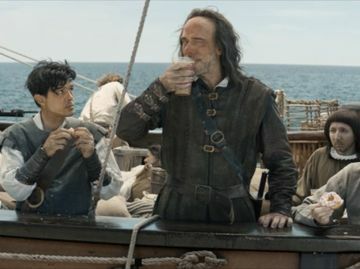 Which of these 12 WonDDers would you like to try? Tell us on our Facebook page!